World of Warren, A portal into Warren's world. I’m still here, not to worry. It’s been a long time and I’m sorry. Every time I look at your pages I’m reminded of the good times we used to have. I know I’ve neglected you and I promise I’ll work on that. For now, just remember that I’m still here thinking of you. To bacon drippings add onions, garlic, and Jalapenos. Saute for 10 min or until softened. Add Thyme, salt and pepper, and other spices. Cook till fragrant. Add the tomatoes, chicken broth, water and crumbled up Bacon. Let simmer for a couple of minutes. Add Peas, and bring to boil. 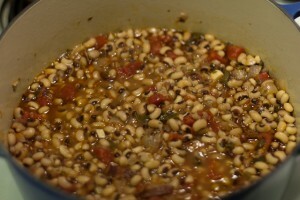 Reduce heat to low, cover and simmer until tender (about an hour). This turned out great! Feel free to experiment and pass on.